Ballwin, Missouri (March 2018) – Ballwin, Missouri-based Americlock is one of the premier manufacturers and installers of custom clocks and digital bell systems for towers and walls. Since the introduction of digital bell systems, the company has been an advocate of utilizing One Systems loudspeakers to reinforce their digital bell systems with musicality and clarity. Americlock offers several solutions and products when it comes to producing the sound of cast bells. The company offers two digital bell systems that reproduce the sounds of cast bells in any location and offer custom tune libraries upon request. These systems are programmed and tuned to include up to 64 synthetic bell notes. Androuais notes that they typically recommend a pair of One System 108/HTC loudspeakers or up to two pairs of 208/HTC depending upon how much the client would like the system to be heard. The compact 108/HTC features an 8-inch coaxial design with clean, point source output. The dual 8-inch, two-way design of the 208/HTC provides greater higher SPL but still has a very efficiently-sized enclosure. Both loudspeakers utilize 316- grade stainless steel (marine-grade) for all structural and rigging points. All metal components that are not structural feature a newly developed marine-grade powder coat over 304-grade stainless steel. The Americlock/One Systems combination can be found all around the world. 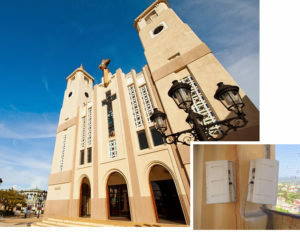 Some of the past Americlock digital bell applications include the San Felipe Cathedral at Porta Plata in the Dominican Republic (pictured), the McAlister Army Depot, the O’Fallon MO municipal building clock tower, and the Oakland Bay Bridge (CFA-2 AW Warning System for the Coast Guard).